Even though there’s no real cookie dough in this smoothie, it sure tastes like it! 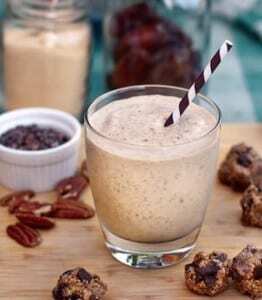 Caramel-like dates, rich and nutty pecans, and cacoa nibs with their hint of chocolate blend perfectly with lucuma powder — which has a natural “cookie-like” flavor — making this smoothie all kinds of fabulous. Reprinted with permission from Superfood Smoothies * © 2013 by Julie Morris, Sterling Publishing Co. Photography by Julie Morris. Blend together all the ingredients except the cacao nibs and coconut ice until creamy and smooth. Add the nibs and ice and blend until frosty, leaving the nibs to serve as the “chocolate chips” and add a crunchy kick. Inherently dessert-like, it is unlikely you will need to boost the sweetness, but taste the smoothie and add if desired. Superfood Boost: Add 1 tablespoon of chia seeds. Would this tasty shake… taste the same without the pecans? Any substitutes? No nuts allowed. 🙁 Thanks! Leigh, if you can do seeds, I’d say that hemp seeds (2 to 3 T) might be a good substitute. Or 1/4 cup silken tofu. Hope that helps!